Private investigators enter the field from various backgrounds. Many have a history with the police, or with the military – time spent in such challenging sectors can certainly help prepare them for the range of risks they may encounter from time to time. While most of us might have a specific idea of how PI's work, there's a high likelihood that such ideas are pulled from novels, films, and television shows – the reality of an investigative career may be very different. With the internet now opening up countless channels of information and public records, a lot of an investigator's time may be spent at a computer, checking or collating facts. Depending on the specifics of their current case, however, they may be required to interview people, or perform surveillance on individuals as they go about their business. Interacting with others may be where the potential for danger lies. While PI's need training and licensing in most states to operate, in certain others, this is not the case, meaning untrained individuals may enter situations without knowing how to handle them best – possibly leading to trouble. Even for fully-trained, fully-licensed investigators, some encounters may lead to hostility, and you'll need to draw on your experience to find a way out. You may even need body armor – primarily, bulletproof vests – in some cases, if you anticipate a risk of danger, but how do you know which is right to keep you safe in a given situation? This guide is designed to help you stay as safe as possible with ballistic gear: whether you're familiar with the basics from your previous career, or you're a novice, we're sure these five tips will boost your personal security, whatever the case. Ballistic vests are tested and rated by the National Institute of Justice (NIJ), and assigned a specific level based on the amount of protection they offer against specific guns. This is one of the most important parts of choosing the right bulletproof vest – if you wear armor with a low rating to pursue an individual you know to be heavily-armed, you may set yourself up for severe harm. Bulletproof vests are rated in five levels: 2A, 2, 3A, 3, and 4. covering 'soft' Kevlar-only armors, and 'hard' vests incorporating ballistic plates (typically made of steel or ceramics) as well as multiple layers of Kevlar. As you perform surveillance on an individual (such as when gathering evidence on a person believed to be cheating on their spouse), you want to maintain a low profile: if the subject suspects things aren't quite right, you may scupper your case – or worse. One way to make yourself stand out from a crowd is to wear a bulky bulletproof vest over your clothing. Armor is available in both overt and covert styles to suit varying applications: the former is worn outside of other layers, while the latter is worn underneath. Covert vests are designed to be more lightweight, with breathable materials for greater comfort during periods of prolonged wear. These are available up to level 3A – the final two levels are too heavy and padded to be hidden under additional layers. If you believe your subject poses such severe danger to warrant wearing the highest level of protection, you'll need to monitor them from a distance. If you're licensed to carry a firearm, make sure your bulletproof vest offers enough protection to stop your ammunition. While it may seem unlikely, accidents do happen – you may fall and inadvertently squeeze the trigger, a shot may ricochet, or your weapon may fall into other hands. Be prepared for all eventualities. Proper fit is essential to ensuring your bulletproof vest offers the protection you need – an ill-sized armor can still leave you exposed to danger. Wearing an oversized vest will leave a gap between the material and torso wide enough for a bullet to pass between; it may also cause the top to push into your throat or drop as you move. On the other hand, an undersized vest may feel too tight, and leave your mobility restricted. Measure your height and chest before your order, and check your results against your supplier's size chart. When ordering your bulletproof vests, it's possible to add more protection to defend against blades and spiked weapons. This will add more to the cost, but could prove invaluable if you encounter an aggressive individual carrying a knife or hypodermic needle instead of a firearm. Stab and spike protection is achieved through a tight weave of Kevlar fibers, to create friction and trap pointed tips before they can tear through. A bulletproof vest may save your life someday, if you find yourself working a case involving dangerous individuals. Take the time to familiarize yourself with the options available, and the advantages each offers. 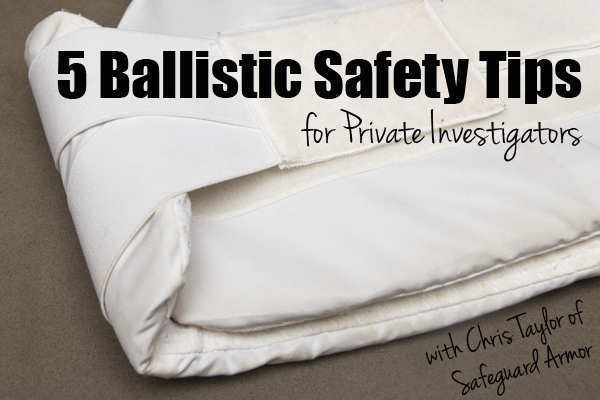 Chris Taylor is an expert writer for SafeGuard Armor, who provide a range of body armor, stab proof vests and other levels of protective clothing.